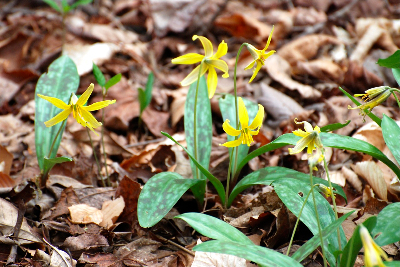 Would you like to celebrate the season by searching for early spring wildflowers? Join TGPAS member and naturalist Ann Walter-Fromson for five wildflower walks. Our first walk will be on the first day of Spring – Friday, March 20 – and then we’ll have four Wednesday morning walks in April. We will visit several watershed trails and area parks and preserves to observe nature’s springtime show of beautiful and ephemeral spring wildflowers. We have a target list of about 30 wildflowers we hope to see in March and April. You’re welcome to join in for one or all of these walks. Bring your binoculars (we might see some migrating birds as well! ), wildflower field guides, water, and a snack; wear sturdy walking shoes. Each trail walk will be out-and-back for a total of 2 to 3 miles. No pets, please. Friday, March 20 – Meet at the entrance to the Bog Garden on Starmount Farms Drive at 9:30 a.m. We’ll look at wildflowers there, then carpool to Beech Bluff Trail on Brass Eagle Loop off Fleming Road. Wednesday, April 1 – Meet in the Whole Foods Parking lot near Friendly Avenue at 9:30 a.m. We’ll carpool from there to the Laurel Bluff Trail head on Church Street. Wednesday, April 8 – Meet in the Whole Foods Parking lot near Friendly Avenue at 9:30 a.m. We’ll carpool from there to the Townsend Trail head on Yanceyville Street. Wednesday, April 15 – Meet in the Whole Foods Parking lot near Friendly Avenue at 9:30 a.m. We’ll carpool from there to Northeast Park off High Rock Road in Gibsonville. Wednesday, April 22 – Meet in the Whole Foods Parking lot near Friendly Avenue at 9:30 a.m. We’ll carpool from there to the Richardson-Taylor Preserve on Plainfield Road. It is time for our Brown-headed Nuthatches to build their nests. Expect egg laying from March to May. Monitoring nests will be needed until mid-June. Please continue to report information to TGPAS! This is an important part of what you pledged when we gave you nest boxes or excluder plates. We want to know any and everything about your box (even “no activity” is information for us). Report to Stella Wear (stellaandtom2605@gmail.com). Register your boxes with Nestwatch if you have not. Last year several members reported frustrations with reporting data to Nestwatch. This year we want to use our group site for all data reporting. Sign in (located in upper right corner) using: username: TGPASociety; password: bhnuthatch. A page called “your data” comes up. Use the choice “add a new site.” Follow steps to locate and describe your box location. There are some drop down instructions that help. As an example, I entered the boxes at Southwest Park (SWPK001, SWPK002, SWPK003) and filled in the box description forms. After you save your entry, you are returned to “your data” page. Click on “nest site list” to see the boxes that have been registered. This is how you will get to your box to enter data when you have something to report. If you have trouble signing into the group site because you have a personal account already, uncheck the box that says “keep me signed in” then you will be allowed to go to another site. If you registered your box last year, you may archive that one, rename it, and register it with the group site. If you need help with this, please contact Stella Wear. Several members of the chapter recently met with Kelley King, Superintendent of the park, to lend advice about the establishment of a wildlife meadow at the park. The septic field that serves the park in now just grass but can be converted into a meadow for pollinators, grassland birds and other wildlife and chapter members with experience are glad to help with our adopted state park. Chapter co-chairs Dennis Burnette and Jack Jezorek have met with Greensboro officials and a representative of Revolution Mills to begin discussions about extending the Lake Daniel/Latham Park Greenway through the Audubon Natural Area and on to the mill. Westerwood neighbors (families, friends, individuals) are invited again to join in conserving two cavity nesting birds who have been in decline after loss of habitats in the wild. The home range of the Brown-headed Nuthatch is from Virginia to east Texas, a smaller territory than that of the Eastern Bluebird. The 14 boxes are along the trail area from Aycock Street to Garland and on East Lake. Several Brown-headed Nuthatch boxes have been added to the existing bluebird trail so that now we are monitoring two species. The nest boxes need to be checked once per week from April through the first of August. 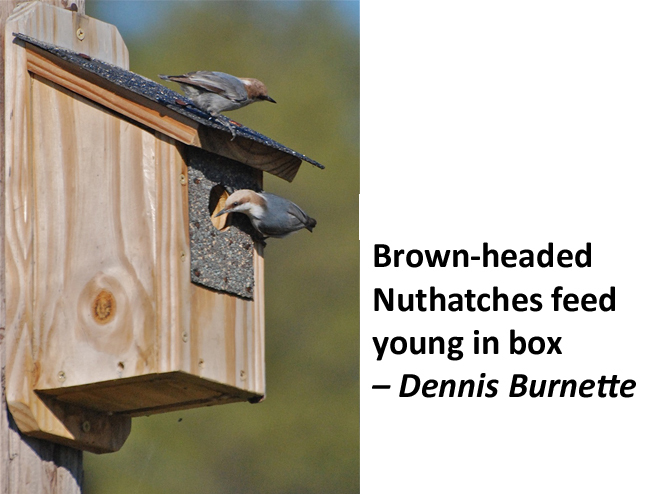 The Brown-headed Nuthatch nesting season is short and the species has only one brood per year, but we will check to see if other species such as Carolina Chickadees might be using the boxes. Consider volunteering for an interesting experience two weeks this season. Training for newcomers will be in early April, when volunteers also will set up the schedule to check the boxes. Contact Barbara Hughes at bthomashughes@bellsoutoh.net with any and to sign up. Audubon North Carolina has released its latest video, giving viewers a special peek behind the gates of the Audubon Sanctuary in Corolla. Take a tour of the expansive habitat, the wildlife and the conservation work to protect birds along the Atlantic Flyway. 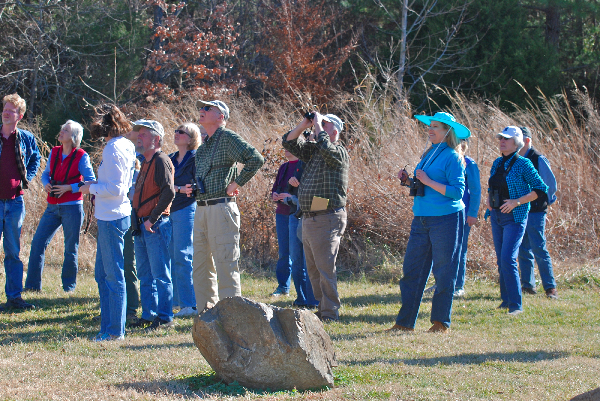 Join Pearson Audubon and the Piedmont Bird Club on Saturday, March 7, for a trip to the NC A&T State University experimental farm in Guilford County to look for birds of open meadows and wet forest edges. A&T Farm is one of the best sites in Guilford County for Wilson’s Snipes, often seen around the edges of the farm pond, which also may host several species of ducks on the water and sparrows around the brushy edges. In addition, American Pipits are possible, although these are less common than the snipes. Sometimes there are large flocks of some of our more common blackbird species around, among which Rusty Blackbirds are a possibility. Raptors of several species usually are seen soaring over the fields. In addition to the good birds usually seen on this trip, those interested in plants will enjoy the early blooming wildflowers in the various habitats. Participants will meet at the experimental farm entrance east of downtown Greensboro on McConnell Road. (Specific directions will be provided by the trip leader.) We will take an easy hike around the farm pond and along the edges of wet woodlands, then reboard our cars and cross McConnell Road to more ponds, fields and the nearby hog farm. Weather in late winter and early spring in our area is notorious for being variable, so dress in layers and be prepared for cool and damp conditions early that could warm considerably as the morning progresses. It would be wise to wear water-resistant footwear due to the many low damp places that occur on the farm in any weather. Bring binoculars and a field guide if you have them. We will be entering the farm property by special permission. Be aware that the number of cars and participants may be limited. We may need to organize carpooling. If you plan to go, be sure to contact the trip leader, Emily Tyler, several days in advance for last-minute instructions. Her contact information is 375-5770, ettyler@triad.rr.com. Be sure to attend our March Audubon meeting. The February meeting included a drawing of Audubon tote bags and local wildflower seeds. The coming months will include door prizes featuring bird seed and other goodies. Ferns and their allies are among the oldest plants on our planet, and are certainly some of the most beautiful. 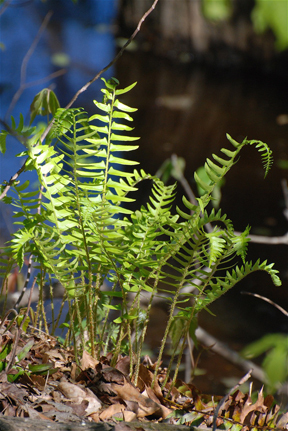 Here in North Carolina we are blessed with a wonderful diversity of ferns, but learning how to identify them can be a challenge. Our speaker, Lisa Lofland Gould, will talk about the life cycle and natural history of ferns, how to begin to differentiate among them, and discuss some of the ferns that do well in North Carolina gardens. Lisa Gould grew up in Winston-Salem in a family of nature lovers, so it is not surprising that she majored in biology at UNCG and went on to earn an MS in zoology (ecology and behavior of birds) at the University of Rhode Island. Lisa taught biology at URI for many years, was a research associate in the Department of Natural Resources Science, and was a co-founder and first executive director of the RI Natural History Survey, a clearinghouse for ecological data in the state. She also initiated the RI Invasive Species Council and was a co-founder of the RI Wild Plant Society. Lisa especially enjoyed leading walks and teaching plant identification courses for state and regional environmental organizations in New England. Among other publications, Lisa is a co-author of Vascular Flora of Rhode Island and Coastal Plants from Cape Cod to Cape Canaveral (UNC Press). Since returning to North Carolina, she had enjoyed participating in activities with the Audubon Society of Forsyth County, the Piedmont Land Conservancy, the Carolina Butterfly Society, and the NC Native Plant Society (where she is serving as Secretary on the board of directors). The meeting starts at 7 p.m., but come early to enjoy refreshments and socialize with other Audubon enthusiasts. When: Sunday, March 8. Meet at 1:45 for 2 p.m. departure in front of Whole Foods Market, Friendly Shopping Center. 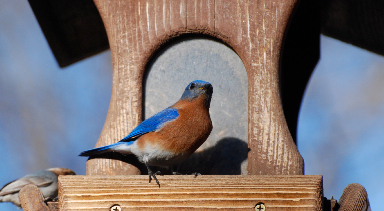 Winter is a fun season to watch birds and other wildlife, but it’s almost over. Join us for our monthly Second Sunday Nature Walk on March 8 as we look for late winter birds and keep an eye out for the first signs of spring. This month we’ll take a Sunday afternoon field trip to Guilford County’s Southwest Park. This 513-acre park has hiking and biking trails, a dog park, picnic shelters, and athletic fields. It’s located on the northern shore of Randleman Regional Reservoir and has a marina where boaters and anglers can put in their own boats or rent one. Southwest Park is a special place for TGPAS. We have constructed the Audubon Wildlife Overlook, a very nice wildlife viewing platform that overlooks wetlands, meadows and forest edge. Recently we added educational signage to help visitors identify the birds, butterflies, and other critters they see. As part of our Brown-headed Nuthatch recovery project, we have installed several nest boxes there, too. Outside the park but nearby is a Great Blue Heron nesting area where we counted 27 active nests last spring. Because of this, we often see several herons flying over on their way to the nearby lake. After we arrive at the park, we will walk a short trail down to the overlook and scan the vicinity for wildlife. If we have time, we may walk one of the other trails in the park to look for early signs of spring. Before departing to return to Greensboro, we’ll stop near the Great Blue Heron nesting site and set up scopes to see if the huge beautiful birds have returned. This should be a fun and easy trip for both beginners and experienced birders. We encourage you to bring friends and supervised kids. As with most of our Second Sunday Nature Walks, we will meet at 1:45 p.m. in the parking lot in front of the Whole Foods Market in Friendly Shopping Center. Look for us next to Friendly Avenue between Chick-fil-A and BB&T Bank. We intend to leave at 2 p.m. and expect to be back in the parking lot by around 5. If you would prefer to meet us at the park, we’ll probably arrive around 2:30. Southwest Park is located at 6309 Southwest Park Drive, Greensboro, NC 27407, but use 3403 Wall Road for GPS purposes. Beginning Birder Walk – Rescheduled…Again! Consequently, we’re going to reschedule it again to Sunday afternoon, March 15, from 1:30 to 3 p.m. As in the previous attempts, we will meet in Price Park in front of the KCEF Branch Library, 1420 Price Park Road, Greensboro. It’s near the intersection of Hobbs and New Garden roads. If you have been following this saga, you know that we want to have a fun, laid-back bird walk especially for beginners, although we know that more experienced folks will enjoy it, too. The emphasis will be on learning to identify birds using clues such as size, shape, markings, habitat, and behavior; and we’ll have fun doing it in a relaxed, no-pressure setting. As we’ve said before, we may make mistakes, but it won’t matter. We’ve called it a walk, but there won’t be much walking involved. We’ll be in Price Park outside and around the KCEF Branch Library. We’ll walk slowly, check out the bird feeder, and practice building our identification skills by watching common birds. As the title implies, this outing is especially for people who think of themselves as beginning birders. The knowledgeable birders in our group started at the beginning, and we will, too. We won’t even need binoculars! 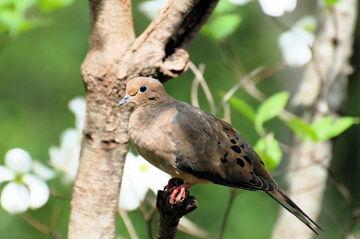 Birds can be identified without binoculars or field guides; however, bring them if you have them. We’ll talk about how to use these tools, and we’ll try to answer any questions participants have. As always, supervised older children are welcome, but no pets, please. We’re hoping for congenial weather, but if this third attempt doesn’t work, we will wait until spring to try again. We have scheduled two more Beginning Birder Walks, a spring walk on Sunday afternoon, May 17, and a summer walk on Sunday afternoon, July 19. Contact the leader, Dennis Burnette, at deburnette@triad.rr.com, if you have any questions. Great Backyard Bird Count: TGPAS Loves Birds! This year T. Gilbert Pearson Audubon offered an introductory program on the Great Backyard Bird Count in February and invited folks to join in a count at Price Park on Saturday, February 14. Nine people attended the Tuesday evening program to hear details about how to participate in the count and enter data online and to practice their bird identification skills. More experienced birders helped those who were new to birding, and participants used the free Merlin bird app for smart phones or relied on print field guides that we provided for the evening. For the Saturday morning count, eight hardy souls joined leader Ann Walter-Fromson to count birds in the park. We split into two groups; Dennis Burnette guided one group that birded around the library and along the wet meadow, and Ann led another group that crossed Hobbs Road to bird behind Jefferson Village along the lake that borders the American Hebrew Academy. Despite the cold temperatures, collectively our two groups recorded 32 different species of birds, including 100 Redheads as well as Gadwall, Bufflehead, Ruddy Duck, and Hooded Merganser. Bluebirds were fairly abundant, and we saw many other familiar birds such as Carolina Chickadee, Tufted Titmouse, White-breasted Nuthatch, White-throated Sparrow, Carolina Wren, and Yellow-rumped Warbler. It was a good morning of birding. We hope you will join in the Great Backyard Bird Count next year. To see the results of this year’s count, visit www.birdcount.org. Not Be Seen in Baltimore? Many of us are familiar with the Bird Friendly Communities (BFC) project of Audubon NC. The Pearson chapter is participating in that effort by promoting the installation and monitoring of nest boxes for Brown-headed Nuthatches and the use of native plants for birds. But there is another part of the BFC program that is beginning to take shape, namely how to address the effects of climate change on our birds and other wildlife. Last September National Audubon released the results of its seven-year study of the effects of climate change on the 588 North American bird species. Of those, 314 are at some degree of risk and 126 are “climate endangered”, threatened with the loss of over 50% of their habitat by 2080. 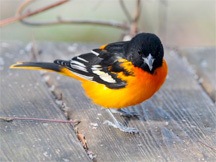 The Baltimore Oriole is one of those. The question, of course, is “What can be done?” Audubon NC is beginning to answer that question. The statewide program to address the problem kicked off in a meeting in January in Winston-Salem. Representing TGPAS were Dennis Burnette, Margaret Kane, and Jack Jezorek. About 40 folks from other Audubon chapters joined them, as well as representatives from Creation Care Alliance of Western North Carolina (http://mountaintrue.org/programs/creation-care-alliance-of-wnc/) and also N.C. Interfaith Power & Light (http://www.ncipl.org/). Both are faith-based organizations addressing environmental challenges. The meeting was a brainstorming session where all participants shared their thoughts on why climate change matters and how we might begin to address it in our organizations and personal lives. The ideas shared in that meeting were collected by Audubon NC staff and will help them to construct a climate-change template that Audubon chapters can incorporate into their BFC projects. Our chapter will learn more about the climate change problem as it affects birds and some possible ways to address it when ANC Executive Director Heather Hahn visits for our May 14 program. Climate change is the very big elephant in the ecological room, and it is incumbent on us to try to ease the beast out. Stay tuned. A great turn out of 18 folks enjoyed the nice winter weather on our February 8th Second Sunday Nature Walk in Price Park. We were hoping for winter birds, and wow, did we see them! The most impressive birds were all the duck species we saw on the adjacent ponds. In addition to the resident Mallards and Canada Geese, we watched Northern Shovelers, Gadwalls, a Red-headed Duck, Buffleheads, Ruddy Ducks, and Hooded Mergansers, and we enjoyed the tub-toy antics of several Pied-billed Grebes. We also saw most of the expected land birds. There were several Eastern Bluebirds, both male and female (perhaps a family group from last season), Blue Jays, Carolina Chickadees, Northern Mockingbirds, Tufted Titmouses, and White-breasted Nuthatches to name just a few. Our Second Sunday Nature Walks take place every month. They’re a great way for beginners to have fun with others who have more experience, and a great way to introduce supervised children to the joys of watching wildlife. We’ll be having another one in March. Check out the trip description elsewhere in this issue. 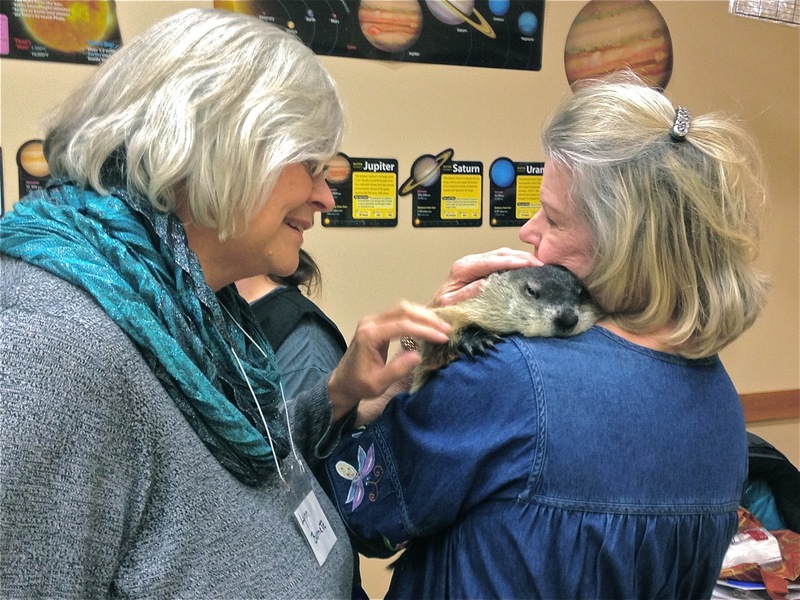 Our February program featured Melissa Coe, president of Piedmont Wildlife Rehab and her two furry groundhog guests, Hansel and Gretel. Melissa spoke about the variety of animals they help such as opossums, squirrels, and rabbits along with baby birds. 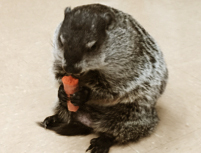 Melissa told us if you find an injured or orphaned animal you should contact a local rehabber or vet and keep the animal warm, quiet and in most cases please don’t feed it. A list of local rehabbers and their contact information can be found at piedmontwildliferehab.org. Piedmont Wildlife Rehab needs folks to help build large outdoor enclosures such as flight cages. Please contact them via their website if you would like to volunteer. April 18 (Sat) Earth Day Celebration – KCE Family Branch Library, Price Park, 1-5 p.m.